I have worked here at Mulberry Court since it was established in 2002. I qualified as a Registered Veterinary Nurse in 2006 and went on to achieve certificates in Anaesthesia & Critical Care and Dentistry. 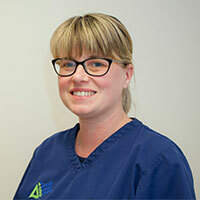 My role at Mulberry Court keeps me very busy, I am responsible for the running and nursing within the Dentistry Referral department of the practice. I have also recently become involved in teaching dentistry to other veterinary nurses in the UK. At home, I have a deaf French Bulldog named Bella and a very cheeky African Grey named Colin!